Andrea Rosen Gallery is delighted to announce the second in a series of two-person exhibitions exploring the affinities between Felix Gonzalez-Torres' and other artists' works. As the following text by Felix Gonzalez-Torres illuminates, Felix was moved and influenced by Roni Horn's work well before he knew her. Subsequently, they became friends, sharing a dialogue of rare intensity. Felix was very good at maximizing the strongest aspect of each of his relationships, and he touched and was touched by many. However, there were very few people who Felix felt akin to in as many fields as he did with Roni-artistic, political, and personal. The format of Felix's memorial was primarily the reading of letters exchanged between Felix and others. Roni was one of few people asked to speak-at Felix's request. The second text below is a portion of that poetic text. 1990, L.A. The Gold Field. How can I deal with the Gold Field? I don't quite know. But the Gold Field was there. Ross and I entered the Museum of Contemporary Art, and without knowing the work of Roni Horn we were blown away by the heroic, gentle and horizontal presence of this gift. There it was, in a white room, all by itself, it didn't need company, it didn't need anything. Sitting on the floor, ever so lightly. A new landscape, a possible horizon, a place of rest and absolute beauty. Waiting for the right viewer willing and needing to be moved to a place of the imagination. This piece is nothing more than a thin layer of gold. It is everything a good poem by Wallace Stevens is: precise, with no baggage, nothing extra. A poem that feels secure and dares to unravel itself, to become naked, to be enjoyed in a tactile manner, but beyond that, in an intellectual way too. Ross and I were lifted. That gesture was all we needed to rest, to think about the possibility of change. This showed the innate ability of an artist proposing to make this place a better place. How truly revolutionary. This work was needed. This was an undiscovered ocean for us. It was impossible, yet it was real, we saw this landscape. Like no other landscape. We felt it. We traveled together to countless sunsets. But where did this object come from? Who produced this piece that risked itself by being so fragile, just laying on the floor, no base, no plexiglass box on top of it…. A place to dream, to regain energy, to dare. 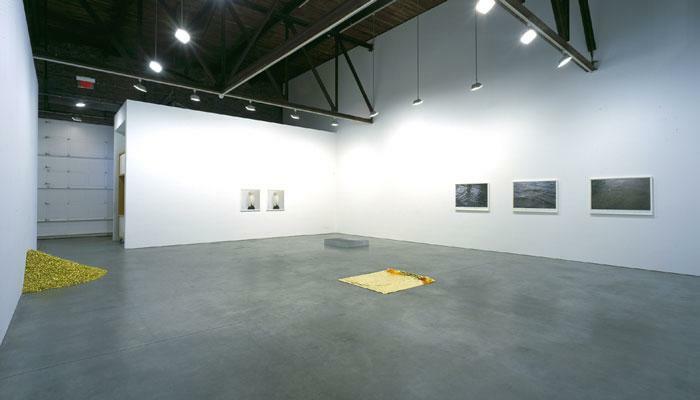 Ross and I always talked about this work, how much it affected us. After that any sunset became "The Gold Field." Roni had named something that had always been there. Now we saw it through her eyes, her imagination. A field of waves, perhaps an ocean: up close two different tiles recur to form a puzzle in which the image of water coheres. Among these tiles a labyrinth forms as my gaze loops between them and the water. I am attracted to the little edibles, brightly colored candies mostly, as I partake of the metaphor that would send you around the world. I am a bumble bee-who would pollinate the world with you. 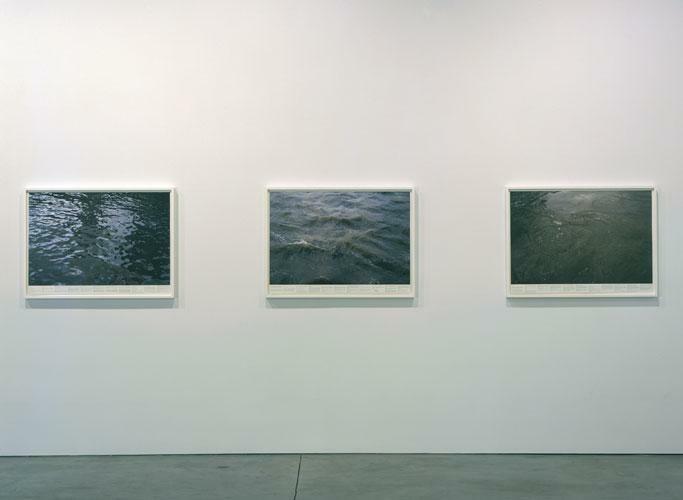 Images of sky, birds, water, murdered people, and certain colors stacked in measures of some critical mass. Each image forms a slice of some lesser but more acute mass that as a letter going out into the world whole, is only completed when it finds the place it is destined for. Each slice signals its own fate. I am cast into an abrasive and exquisite consciousness. Everything of me, everything outside of me is tempered by it. My skin, my consciousness are turned to glass. The only risk left now is that of openness. Framed by sky, buildings, roadways, and signs, the photographs out there on the street-between food and home-bring enigma near. And these enigmas recur. They are riddles that implicate public and private, you and me, us. They open up an Egypt-like space, when Egypt was mostly desert and when Egypt was mostly desert without parking lots, even vacant ones. You are more nature. Your life is a rare form of transparency through which I have observed the world becoming more present to itself and through which I have become more present to myself. And in all of this, I recognize you, Felix, as another weather. This exhibition is part of an ongoing series of five exhibitions addressing pairings of artists with whom Felix Gonzalez-Torres' work shared an affinity. Initiated in January 2005 with an exhibition of Felix Gonzalez-Torres and Joseph Kosuth, these exhibitions will be interspersed in our program over the next year and a half. 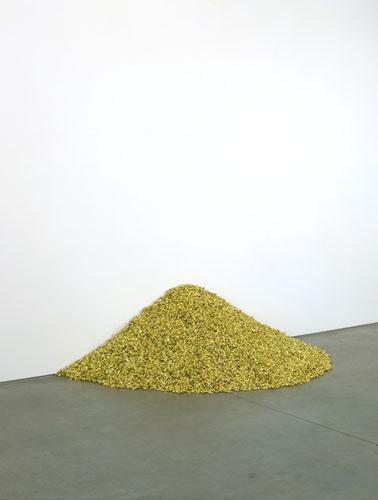 Although each will take on its own form, for this exhibition Roni Horn has chosen the specific works; among others, the subject of Gonzalez-Torres' text, "Gold Field", 1982, and a piece Felix made in direct response to this work, "Untitled" (Placebo-Landscape-for Roni), 1993. 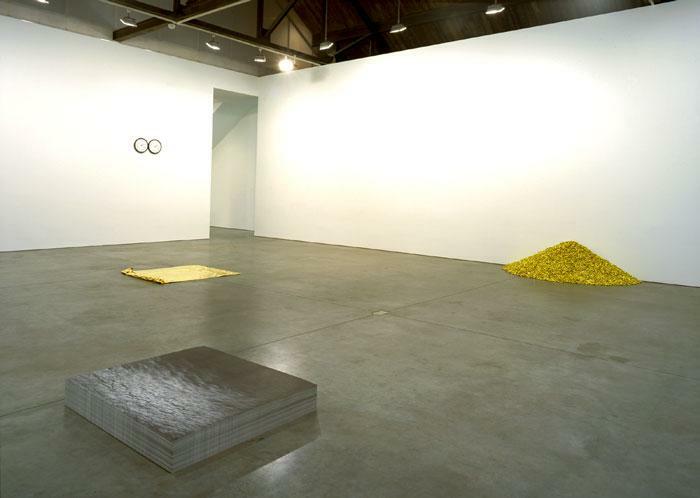 Although it is not included in this exhibition, it is interesting to note that Roni Horn made a second gold field piece, "Gold Mats, Paired-For Ross and Felix", 1994-1995, after experiencing "Untitled" (Placebo-Landscape-for Roni). We plan to publish a catalogue documenting this series with newly commissioned texts for each pairing. Additionally, in the fall of this year, we are anticipating the release of the monograph Felix Gonzalez-Torres edited by Julie Ault and published by steidldangin.